Kalemegdan Fortress is another name of the Belgrade Fortress, which is now the main historical landmark in the territory of the Serbian capital Belgrade. Extremely authentic, it holds a massive and historic intensity. Kalemegdan Fortress is the Turkish name of this Serb stronghold and it dominates the right bank of the Sava River, where it flows into the Danube. From the castle you can enjoy amazing views of the place where two rivers become one. Kalemegdan Fortress was officially declared a cultural monument of exceptional importance in 1979 and since then has been under the protection of the Republic of Serbia. The etymology of the name Kalemegdan brings us to the Turkish word Kalemeydan, which translates as - castle and square. The medieval town – Kalemegdan, then with the same name was first mentioned by Pope John VIII who wrote to Boris I on 16th April 878 years. Further more, Belgrade and the Kalemegdan Fortress was consistently part of the First Bulgarian Empire, Byzantium, the Second Bulgarian Kingdom, the Kingdom of Hungary and the Ottoman Empire. The Belgrade fortress Kalemegdan is built on a hill with its main function to protect the settlement site of present-day Belgrade. No specific data is revealed to tell exactly when the foundations of Kalemegdan were put in place, but there are suggestions that the fortress was built immediately or shortly after the founding of the medieval town of Prince Boris I. The fortress wall covers ancient fortifications of Singidunum, in the course of history several times before the modernization and expansion since its conquest by the Ottomans in 1521. Fortress Kalemegdan is also now known as the Belgrade Fortress and is full with white stone. It is believed that the very name of Belgrade comes from those bright stone blocks which were used in the construction of Kalemegdan. In medieval times, Kalemegdan operates as a city-fortress of utmost importance. Located right in the most western point of the country at the time, Kalemegdan Fortress owes its primary role to its strategic location. The fortress proved crucial to protecting the integrity of the Bulgarian borders. From the highest hill of the castle Kalemegdan has better visibility and control capability of the Pannonian Plain and the approach from the west to Constantinople and the Orient in Via Militaris, which is an ancient road built by the Romans, passing through Belgrade (Sigindunum), Nish (Naissus), Sofia (Serdica), Edirne (Hadrianopolis) and came to Constantinople. 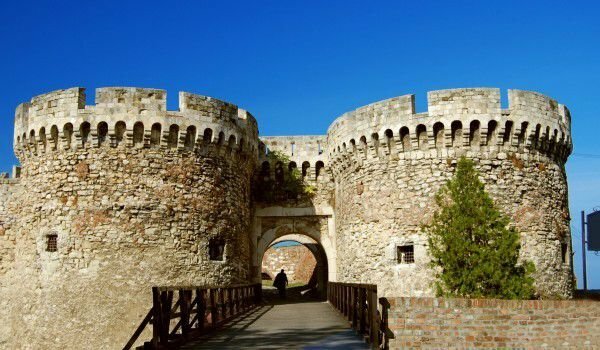 Today this fortress is one of the most important tourist attractions for tourists in the Serbian capital. The castle is attractive with its clock tower built in the 16th century. Next to the fortress within the Kalemegdan park you can visit the zoo.